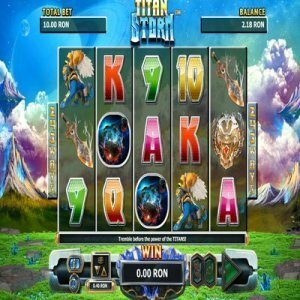 [mrgreen] Fans of slot machines and Greek mythology will adore Titan Storm. Which Company Released this Slot Machine? NextGen Software’s game innovators built this video slot machine. Titan Storm spins five reels and delivers 25 optional pay lines to the player. That list covers the “standard” spots on Titan Storm’s reels. For the game’s wild spots, read the next section. Titan Storm’s wilder side includes a wild spot adorned with the image of Zeus. It can substitute for any other spot in the game to create winning combinations. Keep an eye on Zeus’ image. He sometimes moves and casts lightning bolts! This myth-driven reel-spinning game also includes a “scatter” spot. It features a representation of the temple on Mount Olympus. When three scatters appear anywhere on Titan Storm’s layout, the game’s free-spins feature activates. This feature awards the player ten free spins, and the game’s rules tell of “titanic” available prizes. The player can win up to 10,000 credits on one pay line in Titan Storm. During this game’s free-spins feature, all five-of-a-kind prizes pay out at five times the normal value. If the player hits five Hera symbols on one pay line, the normal award would be 2,000 credits. During a free spin, five Hera symbols win the player 10,000 credits. Titan Storm’s graphics and soundtrack keep the player’s attention. The reels spin smoothly. An imaginative player will get lost in the idea of playing slots with the gods, goddesses and mythical characters worshiped by an ancient people. Few slot titles draw on that history. For those who love slot machines and ancient Greek mythology, Titan Storm is a winner!